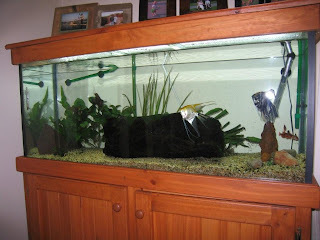 Thought I'd post a photo of the fish tank. I have a minor issue with some black flowering algae at the moment, and a population problem with the Neon Tetras. There are only three of them left. Having started from eleven, it may be time to go get some more. That'll keep the Angels happy. You can see them up front of course. Show-offs.